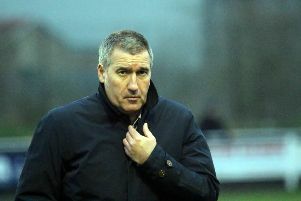 Banbury United’s relegation survival hopes took a battering in Saturday’s Evo-Stik Southern League clash at Cambridge City where they were thumped 6-1. City began much the better of the two sides in the premier division contest and it was no surprise when they went ahead in the 11th minute when a low cross was turned in by Fejiri Okenadirhie. United responded well and equalised in the 21st minute when Jordan Green was brought down in the box and Guy Tahin’s spot-kick hit the post before going in off keeper James Head. City went close when an Andrew Phillips’ shot was deflected just wide and a poor back pass let in Okenadirhie but his attempted lob over Leigh Bedwell failed to beat the Puritans keeper. But it was all City after the restart and only some last ditch defending and sound handling from Bedwell kept them out. But City went back in front in the 62nd minute when a Josh Dawkins’ free-kick went across the six yard box and found its way into the far corner of the net. Just 60 seconds later and it was 3-1 when Dawkin scored from the penalty spot following a handball offence. A fourth goal arrived in the 68th minute when Dawkin ran through the middle before releasing Phillips who slotted the ball home with Bedwell to beat. It got worse for United with Phillips lobbing Bedwell in the 75th minute before Buster Harradine wrapped it up in the 90th minute with a 25 yarder which flew into the top corner of the net. The only consolation for manager Paul Davis was that United’s relegation rivals, apart from Frome Town, all failed to pick up points.